You're involved in a six-deck game where doubling on any two-card hand is allowed. You're dealt a five and a four for a two-card total of nine and the dealer shows a six as his upcard. Standing with this hand is obviously not a wise option here, so the choice is between doubling down or simply hitting the hand. The decision you have to make essentially revolves around whether it is worth your while to put extra money on the table. Is it? Yes, it is. And it's not really much of a dilemma. You know, drawing a nine is not the strongest position you can have in this game, but it's not the weakest either, especially when you're up against an upcard of six, which will result in a bust for the dealer (regardless of what anyone else does) about 42% of the time. Of course, starting with a nine, you stand a good chance of having a pat hand at the end, and so it makes logical sense that you'd want to get some extra money on the table to exploit the situation. Indeed, if you do the right thing here, you're looking at about a 55% win rate, so it's the play to follow. In fact, it represents approximately a 24% gain over what will happen by NOT doubling down. 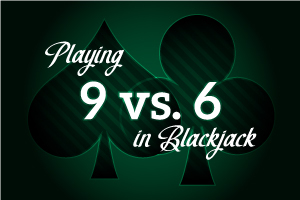 One of the key factors to winning at blackjack is to know when your winning opportunities are and jump on them. This is such an opportunity. Double this hand and don't even think twice about it. These bonuses allow you to play blackjack to clear the bonuses wagering requirements. Max bet size on any game is €15. 45 X turnover requirement. This bonus is not available to players in the following countries: Belarus, Bulgaria, Moldova, Ukraine, Romania, Russia. Bonus will expire 3 days after activation and must be used/completed in this time. Your bonus will be automatically inactivated if you make a bet over €20 or less unless specified in the specific bonus conditions.